A vintage Lockheed Constellation aircraft known as the “Connie” is making its way to NYC to become a cocktail lounge, and it was finally spotted in Times Square this weekend. The rare L-1649A Starliner was recently restored for its new purpose, and had a ceremonial send-of back in early October before heading out on its journey to JFK Airport. On Saturday, March 23, the large vintage plane made its way through the most chaotic part of the city, Times Square. Some background info: Tyler Morse, CEO of MCR and Morse Development (the company behind the TWA Hotel) said the plane flew for Trans World Airlines for three years and then went on to fly around the Alaskan wilderness as a bush pilot plane. From there, he said, the plane was used in South America: “It had giant cargo doors to fly pallets of marijuana around South America.” It was later abandoned and then brought back to the states in the 80s, where it sat on a tarmac for years. Now, it will have a new use inside the JFK airport’s hotel. It is one of only 44 Starliners built by Lockheed between the 1940s and 1950s, and one of only four still around today. To celebrate its arrival in the heart of the big apple, mayor Bill de Blasio joined Morse for a welcoming event. 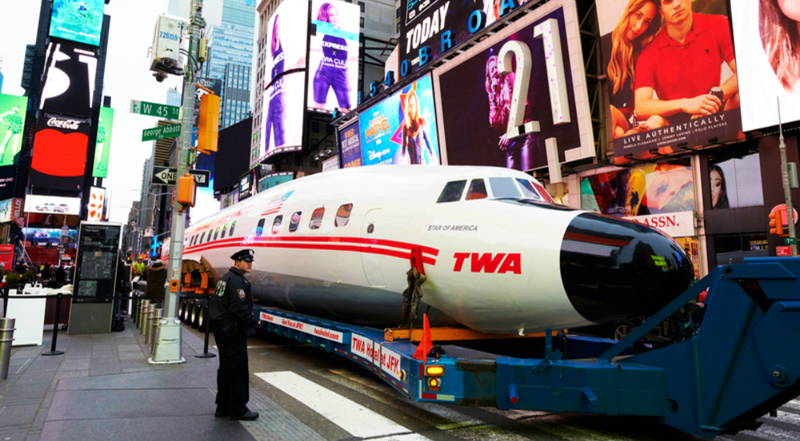 The plane can be seen in Times Square along Sixth Avenue until Sunday night, March 24, right next to its eight-story-tall billboard. Once its 328-mile-journey to JFK from Maine is complete, it will serve as the cocktail lounge at the airport’s new TWA Hotel, which has already begun taking reservations for their May 15 opening.